We all know that a beautiful lawn with a professional landscape design can completely change the look and feel of your home, or even add up to its value on the real estate market through the curb appeal effect. Moreover, having a beautiful lawn can be an owner’s pride and joy, since it’s the first thing people notice about your home, including the people you won’t invite in anytime soon. The lawn can be equated to one’s business card in the neighborhood, which is yet another reason people take lawn care pretty seriously. Last, but not least, a well landscaped yard can provide a good setting for many outdoor activities, so the space needs to be functional to a high degree. Landscaping Dale City VA is, in our vision, an opportunity to deliver people barbecue and picnic spots, outdoor reading corners, places for safe children’s play and so on, all wrapped in a stylish and beautiful form. All this and a 100 percent customer satisfaction guarantee have made us at Precision Lawn & Landscape the most reliable lawn care and landscaping company on the local market. We have an accumulated experience of over 7 years in all kinds of lawn and yard related services, and we always deliver cutting-edge, durable and personalized results. Our staff is highly trained and certified to handle any in-field situations which may arise during the job, and our philosophy is that a job well done should also focus on preventing extensive work in the future. This philosophy of prevention makes the Dale City VA residents already on our client list more than satisfied with our services. Maintaining our large-scale works is easy as pie both for us and the client, and our landscapes remain beautiful after a long time as well. For example, if we perform flower bed design services, we pay close attention to what the client expresses about their personal preferences, but we also take into account using only local species of flowers and plants, native to the Virginia environment. This way, we make sure that our flower bed will adapt to the weather and the soil conditions smoothly and with little need of intensive maintenance. Another example is related to how we do our mulching: first of all, we are experts in installing wet mulch if the client desires it, which is much trickier but also more effective than dry mulch; and second at all, we also take weed prevention measures during the mulching stage. This way, the future lawn has a sturdy foundation to grow on and will require less tending to on the long run. 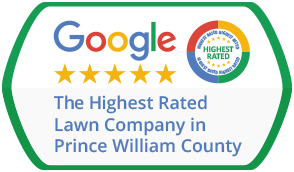 We could go on and on, but the bottom line to all this is that Precision Lawn & Landscape should be your first choice in landscaping and lawn care for the area of Dale City VA. Feel free to call us anytime and ask for a free estimate, quotes, and examples of our previous work. Our job is to make home owners happy with their lawns and yards, and our 100% customer satisfaction guarantee shows that we are completely confident we are the best.